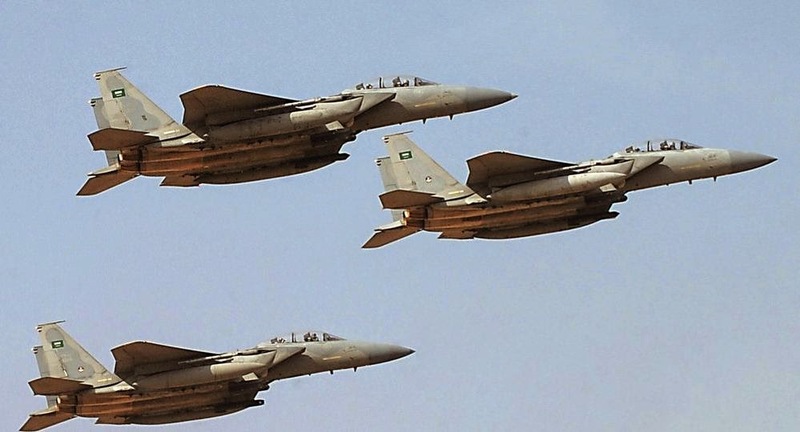 Fighter jets from Saudi-led Arab coalition have continued bombing Houthi targets in Yemen for a second day, including the Shia insurgent group’s stronghold of Saada in northern Yemen. The Arab coalition has said its goal is to roll back Houthi advances since February, when they captured the capital Sanaa and overthrew the government of President Hadi. It would be hard, however, to imagine that the coalition could succeed in pushing out the Houthis with airstrikes only. Meantime, President Hadi arrived in Riyadh on Friday, after leaving his embattled country. He will joined other Arab heads of state in Sharm el-Sheikh, Egypt, on Saturday for a two-day Arab League summit on Yemen. The summit convenes at a historic moment in Arab history. The long-held dream and aspiration of the Arabs to establish a unified military force is becoming a reality in the operation in Yemen, bringing together all major Arab militaries to stop the Houthis. The summit ultimatum is for Ansarullah to quit Sanaa and disarm within three days. To that effect, RSAF is striking Houthi cultural sites and unverified accounts claim civilian targets. The real test for this "Arab Army" will come should it launch a ground invasion likely from the Rub al-Khali desert and then pivot into south Yemen, and/or land at Port Aden; with a required military occupation. Risky undertaking, and would require substantial U.S. logistical support. Naive thinking at best and my comment will never see daylight due to Uskowi's vain propaganda. There WILL BE NO LAND WAR as the coward Saudis don't have manpower and the Pakis have refused. Iran has successfully achieved it strategic target to ensure Saudi regime and armed forces lose their face in front of poor Arab masses. By using its expensive military machine which has been gained by selling oil to West for weapons while majority of Palestinians are starving in refugee camps, and using that specific military machine to not bomb, as Arabs call it, Zionist Israel, but rather a poor Arab neighbor, killing Muslim Arabs in masses. This is a major Public Relations loss for Saudi Arabia, no matter what the regime says. It doesn't matter the Houthis are Shias...they are Muslims and they are Arabs...and guess what? they are bombed by the Army of the Protectors of the Holy Shrines, i.e. the Saudi Arabian Army. From this moment on any attack towards the mainland Saudi Arabia is legitimized and attacking them is no longer crossing a red line. This is the second taboo that is no longer existing. As per the allies of the Saudi Arabia, Egypt has no choice than to act as it has huge internal problems and it needs an external enemy. It also has huge financial problems and need the Saudi money supply to survive. Further more it has lost its status in the Arab world and must re-establish it. For UAE and Qatar, Kuwait and Bahrain, they are gambling hard by getting directly involved as they are far more vulnerable against angry Arab masses than Saudi Arabia is, due to their small sizes which require stability to survive. As per Iran, it holds a cool head for the moment and doesn't let the Saudi "noise" to disturb its ongoing negotiations with the major powers, as such no harsh statement has been issued but we should expect some post negotiation as Iran will not let the Saudis to reverse the events in the strategic important region such as Yemen. does have any one calculated the cost of the war with such low oil price ? The most factual analysis so far. The Saudis have committed strategic suicide and now have eternal enemies within and with out. It is not much considering the strategic gains by Iran. The Saudis besides suffering humiliation have already lost 2 F15SA and despite having Pakistani pilots have proved pathetically inept. The Iranian Misagh 2 manpads brought down a Saudi F-15 near Sanaa, that is a glowing tribute to Iranian weaponry.
" A Saudi-led military operation has targeted a base where Iranian-backed Houthi fighters had set up long-range missiles and pointed them towards the southern Yemeni city of Aden and neighboring countries, a Yemeni official said on Saturday. Iran denies allegations made by some Yemeni and Western officials that it is providing money and training to the Shi'ite Muslim Houthis, whose rapid territorial advances triggered an Arab military campaign against them. The official, a member of the Yemeni delegation at an Arab League summit in Egypt, showed Reuters mobile phone pictures of a huge orange mushroom cloud, saying it was the force of the rockets exploding at the base after it was targeted. He did not specify which countries the rockets were directed at." Why is he silenced ?